In this Techno World, with the increase in automation and different technical scope, client demands more accurate and more precise projects. To fulfill such needs one can't handle the task as a whole, it must be broken down into small segments and done accordingly. And agile is one of the best methodologies to do that. Each employee in an agile team is a great asset to one's company and for the same reason, interviewer always seeks a good knowledge in a candidate, so preparing yourself is always good to be on a safer side. Here are some of the top hand picked Agile Interview questions which will help a candidate to become a member of the agile team. Let's start with the top Agile Scrum Methodology interview questions. Q. 1) How long the scrum cycle last? Ans. 1) Basically, Scrum cycle depends on the project size and the team size. Team size may vary from 3 members to 9 members. Normally it takes 3 to 4 weeks to complete a scrum sprint. On an average, a scrum sprint ends in 4 weeks. 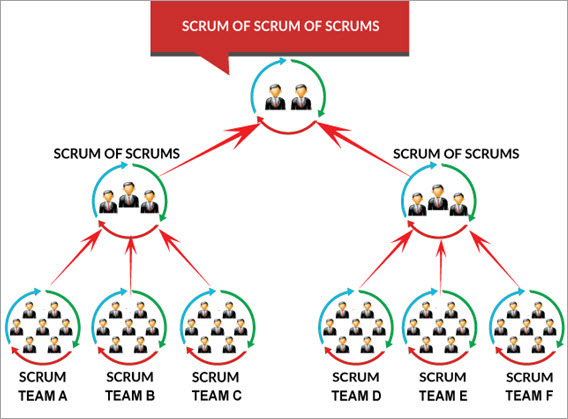 Q.2) What is the scrum of scrums? Ans. 2) Suppose there are 7 teams working on a project and each team has 7 members. Each team leads its own particular scrum meeting. Now to coordinate among the teams a separate meeting has to be organized, that meeting is called Scrum of Scrums. An ambassador ( a designated person who represents team) represents its team in the scrum of scrums. (a) The progress of the team, after the last meeting. (b) The task to be done before the next meeting. (c) Hindrance which the team had faced while completing the last task. Q.3) Explain the term ‘increment'? Ans. 3) When the team finishes the sprint, hopefully, they have completed everything they forecasted. Sum of all the product backlog items which were completed in a sprint is called increments. This new increment also has the value of increment of the previous sprints. Ans. 4) Sashimi is a Japanese word which means pierced body. Basically, it is a Japanese dish which consists of fresh meat or fish, sliced into thin pieces. Each piece is similar in taste when compared with the other pieces. Sashimi in scrum methodology means every phase of software development cycle in a sprint which includes requirement analysis, planning & design, development, testing, documentation is complete or not and the product is ready to be displayed etc. Q.6) Explain ‘scrum poker' or ‘planning poker' technique? Ans. 6) Scrum poker also called as planning poker, is a card-based estimation technique which is based on a general agreement. 1) To start it, the agile user story is read either by the customer or the owner and the estimator understand its features. 2) Each estimator has planning cards with different no. on it like 0,1,2,3,5,8 and so on. These values on the card are ideal days or story points. 3) Estimator select cards based on their estimation by discussing features set by the product owner. 4) If a common value is selected, it is an estimate, if not they discuss their max. and min. estimation. 5) This process is repeated till a general agreement is reached. Q.7) What are the principles of agile testing? Q.8) What are the disadvantages of the agile model? d) High-level decisions are under the hand of Veterans, if not combined with non-experienced one, freshers have little scope to grasp proper knowledge. Q. 9) When to use agile model? Ans. 9) There are some development and methodologies where you can use agile like feature-driven development, lean software development, crystal methodologies, dynamic development. Q.10) What is Release candidate? Ans. 10) The release candidate is a code /version /build released to make sure that during the last development period, no critical problem is left behind. It is used for testing and is equivalent to the final build. Q.11) In what way does agile testing(development) methodology differ from the other testing(development) methodologies? Ans. 11) In Agile methodology, the code is broken into small parts and at a time, only that particular code is worked or tested. Continuous communication on the particular code part is done by a team so that the focus is only on that particular code. This makes the agile process more flexible and focused. Q.12) Can agile methodology also be applied in other than software testing and development projects? Ans. 12) There are several places where agile methodology can be applied in the field of biochemistry, biophysics, bio-medical or at the place where there is insufficient data, where the project needs to be completed in a small team, where to work in unknown and there are several areas. Q.13) How do you know if you are using agile development? Q.14) Explain what is a story point in the scrum? Ans. 14) It can be considered as a unit to estimate the total efforts required to complete or to do the particular task or implementing a backlog. Q.15) What does the X and Y axis of burndown chart? Ans. 15) In burn down, chart X-axis shows working days and Y-axis shows remaining efforts. Here, in the image blue line depicts the ideal time suggested for completing the project. For example in a project ideally, 28 tasks (efforts) are pending on the starting day of the project. And the project is scheduled to be completed in 20 days. So on the 20th day, zero task (efforts) should remain, which means the project should get completed. On the other hand, red line depicts the actual task (efforts) given with respect to the days. Here on the day 5, 7 tasks need to be completed as per planning, however, in actual only 4 tasks were completed. Thus, it provides proper tracking down of the progress of the project and thereby helps in improving the efficiency and on time taken to deliver the project. Q.16) What are the main roles in the scrum? 2) Scrum master: – scrum master is responsible for the proper execution or working of the scrum team. Being a servant – leader and a coach, he ensures the proper productivity of a team towards scrum an sprint goal. Q.17) What is product burn down chart? Ans. 17) A description in the form of the graph which shows implemented and not – implemented product backlog is called burndown chart. Q.18) What is sprint burn down chart? Ans. 18) A graph used to describe no. of implemented / non-implemented sprint in scrum cycle. Q.19) What is Release burn down chart? Ans.19) Graph used to depict the pending release which was earlier planned is called Release burn down the chart. Q.20) What is defect burn down chart? Q.21) What is sprint planning meeting? Ans. 21) Sprint planning meeting is joined by all entities like scrum master, product owner and whole scrum team where they discuss the priority features of the team and product backlog items. Q.22) What is Sprint Retrospective meeting? Ans.22) This is mostly the last part of the sprint or may be done after sprint review meeting. Scrum master and the whole team participate in it, they discuss ‘ what was good during the sprint',' what was bad',' what needs to be improved'. It generally lasts for 2-3 hrs. Q.23) What do you know about ‘build-breaker'? Ans .23) When sometimes developers accidentally commit bug in the software and when such bug stops the compilation process or generates the warning or failure in normal execution of testing, we say that the build is broken and the major priority of the tester is to get back again to the normal stage by resolving the bug issue. Q.24) Tell me something about Kanban? Ans.24) Kanban is a tool which helps the team to overlook the work ie., its progress. Progress, as well as the status of your current development story, is perfectly described using kanban and more accurately it is done by ‘Kanban board'. Kanban board allows you to write the whole scenario of your project at a single place so that you can get a perfect picture of the bottleneck, a task done, workflow progress or basically the complete status of your project. Q.25) Describe the places where ‘Scrum' and ‘Kanban' are used? Q.26) Why aren't user stories simply estimated in man hours? Ans. 26) Estimation of user stories on the basis of man-hours can be done but preferably not. You won't be able to concentrate on the quality product to be delivered to the customer. Moreover, you will concentrate on cost and budget of the management while using man hours. Q.27) Name three other Agile frameworks? Ans.27) Test Driven Development, Feature Driven Development and Kanban. Q.28) Should scrum master remove impediments on behalf of the scrum team? Ans. 28) Scrum master can do that, but he should not. Scrum master should neither over-rule nor pamper his/her team. Initially, there may be chances of failure, unplanned excursions or dead-end where the team can trap, here scrum master should support them and show the proper way of getting out of it. Scrum team should be independent to take its own decision. Q.29) How does agile testing (development) methodology differ from another testing (development) methodologies? Ans. 29) In agile testing methodology, the entire testing process is broken into a small segment of codes and in each step, these codes are tested. There are several process or plans involved in this methodology like communication with the team, short strategical changes to get the optimal result etc. Q.30) How would master recommend following-up on action items? Ans. 30) The best way of doing that is by setting follow-up of the task/list to be done by the member pick at team retrospective. Scrum master should collect the information or status of the action items from the previous retrospective before moving further with the new one and if any of action items remain uncovered or untreated, the cause or the reason should be known to avoid it's further happening. Q.31) Which are the top agile matrices? 1) Velocity: – Tracking your velocity gives you the clear idea about your progress, capacity etc. Measurement can be done by the sum of all approved estimates of the stories. 2) Work category allocation: – This factor provides us a clear idea about where we are investing our time or where to set priority. 4) Cumulative flow diagram: – With the help of this flow diagram, the uniform workflow can be checked, where X-axis shows time and Y-axis shows no. of efforts. 5) Sprint burn down matric: – Tracking on the completion of work along with the sprint is done. 6) A business value delivered: -Business value delivered is an entity which shows the team's working efficiency. This method is used to measure, in which around 100 points are associated with each project. Business objectives are given value from 1,2,3,5 and so on according to complexity, urgency, and ROI. 7) Defect resolution time: – It's a process where team member detects the bug and priority intention by the removal of error. Agile methodology is designed to complete the task in the shorter time slot, which precisely satisfies the needs of the client and at the same time scrum is famous for its flexibility according to the requirements. In this article, we have touched top Agile Interview Questions which are most popular and frequently asked. This, in turn, will surely benefit you from the point of an interview as well as brushing your Agile and Scrum knowledge. If you have any more questions, please share in the comments section below.